Happy Confetti Plate Week! I don't know about you, but so far this week has been pretty easy - I didn't realize that I do typically eat at least one salad a day. Getting to eat exactly the way I normally do and counting it as part of an eating challenge is giving me such a false sense of accomplishment! Okay, honestly I have been more thoughtful about the choices I make, skipping out on things that aren't whole-grain, and successfully avoiding potatoes entirely. I love the way I've felt this week, energy-wise and mentally. It's amazing what just knowing you're treating your body well will do you for! I'm so excited to share the recipe for this salad which we discovered last autumn and made almost weekly (sometimes more) all the way through "kale season." Chopped kale, diced cucumbers and apple, toasted pecans, blue cheese crumbles, and dried cranberries make up the majority of this salad. Then you add grilled chicken if desired (this is recommended, as it takes the salad into fully-filling territory), and toss the whole thing with a yummy citrus vinaigrette. Though I only have one photo of the salad (since I made a huge bowl of it last night and the family wasn't into delayed gratification when it came to dinner), you'll be able to see how pretty, substantial, and flavorful this salad is. My favorite thing about this salad would have the be how you can buy one of those giant 1 lb. bags of chopped kale and have almost all of your prep work done for you. I'm all about the easy road when it involves pre-chopped kale. I hope that have a great weekend and that if you're in the path of one of these hurricanes that you stay safe and sound and come out okay. I'm headed up to NoVa to spend the weekend with friends and hopefully get in some gorgeous time in this gorgeous weather which feels so very much like fall. 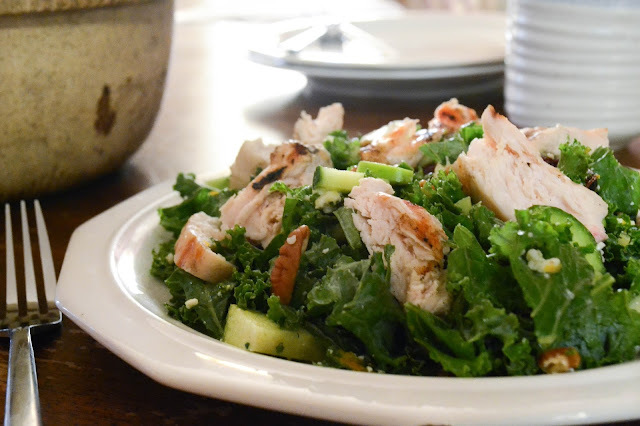 Grab a huge bowl and toss in the kale. Massage and squeeze it with your fingers and palms (I realize this sounds weird, but trust me) till it is tenderized. Add apples, cucumber, cranberries, pecans, and blue cheese and toss. In a small bowl whisk together the lemon juice, zest, salt and pepper, and olive oil till emulsified. Pour over salad and toss, then serve and top each salad with 1/2 of a grilled chicken breast. This looks so good, I love salads! Thanks! I think you'll be really pleased with the combination of flavors - I know I can get easily "bored" of salads so I'm always on the lookout for new ideas! Thank you! I'm glad you're going to try it - I think you'll be hooked!